This kitty cat themed slot game is filled to the brim with all things pink and comes with a dash of cuteness. If you are in awe of little Miss Kitty and want to play a differently themed slot game, then you should give Miss Kitty Slots a try. Based on the famous character of Miss Kitty, it features a cat theme. This 5 reel slot game comes with 50 paylines, sticky wilds, free spins, the bonus round and feline friendly visuals. Come and try out the game for yourself at Casino UK. Play for free with our mobile casino no deposit bonus. Free Miss Kitty Slots Game With Mobile Casino No Deposit – Login Now! At Casino UK, we have a wonderful treat for our new players. All you need to do is sign up an account with us and we will reward you with a free mobile casino no deposit bonus of ₤5 to get you started with. And that’s not all! Make your first deposit with us and get a 100% match up to your deposit up to ₤500. This means that if you deposit ₤500 you get ₤1000 in your account and another 50 free spins on selected Slot games. Play Miss Kitty Slots game for free with mobile casino no deposit bonus at Casino UK and try your luck without any risk. All our casino games at Casino UK are mobile friendly and compatible with major devices of Android, iOS, Blackberry, Windows and more. Simply take out your smartphone, access our website for a customised game screen. Play to your heart’s content from anywhere at your leisure. Moreover, you can now make phone bill deposit at Casino UK. All you have to do is, share your mobile number, select the amount you wish to deposit and get done with your deposit. You don’t have to share your confidential details of bank accounts, cards and other details. Get done with your deposit without any hassles. Miss Kitty Slots game feature several relevant symbols like a mouse, a ball of yarn, birdie, milk carton, Miss Kitty herself, the moon and some other standard symbols. The game is set against the backdrop of a night skyline of a big city, where the upscale Miss Kitty lives. Also, the pleasant casino style sounds from the musical backdrop with a nice jingle and playful meows of Miss Kitty. There are many slot machines that come with a cat theme. 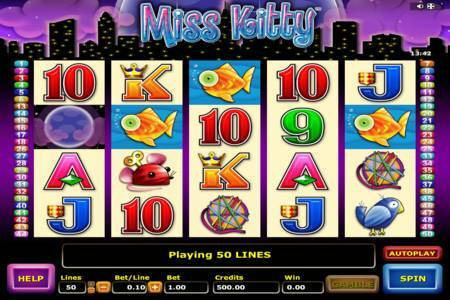 Miss Kitty slots machine is another addition to the same, with many pleasing features. The wild symbol of this slot game is Miss Kitty herself and she will fall in only the 2nd, 3rd, 4th and 5th reels to substitute for other symbols, except the bonus and stacker symbols, in order to make a winning combination. The moon symbol represents the scatter symbol and the stacked Fish symbol results in a payout on all 50 lines. With all these features paired with the Miss Kitty, Slots bonus round will result in a lot of exciting action and a chance to strike big prize wins. Betting limits can range from 0.01 to 4.00 coins making it a great game for all punters. The maximum payout you can gain is 100,000 coins. Make use of the mobile casino no deposit bonus to play this slot machine at Casino UK for free and see for yourself what chances you have to gain from it. The scatter symbol which is the Moon icon is what you have to watch out for in order to activate the bonus round. Once the moon icon appears on the 1st, 2nd and 3rd reels, get rewarded with 10 free spins. During the Miss Kitty Slots free spins, Miss Kitty will remain where she is from the 2nd to 5th reel when she appears. So this will give you a chance to build up the Miss Kitty wild symbol throughout the free spins. The most attractive feature of the Miss Kitty Slots game is its bonus round, It can be a bit tricky to reach the bonus round. But, if you make it you stand a great chance to generate a sizeable payout that can be well worth the wait. The sticky wild feature of the Miss Kitty Slots bonus round, 50 paylines, free spins and stacked icons offers decent returns to players, making it a very appealing game for high-rollers and budget players, alike. Catch all the action for free at Casino UK now, by simply signing up with us!